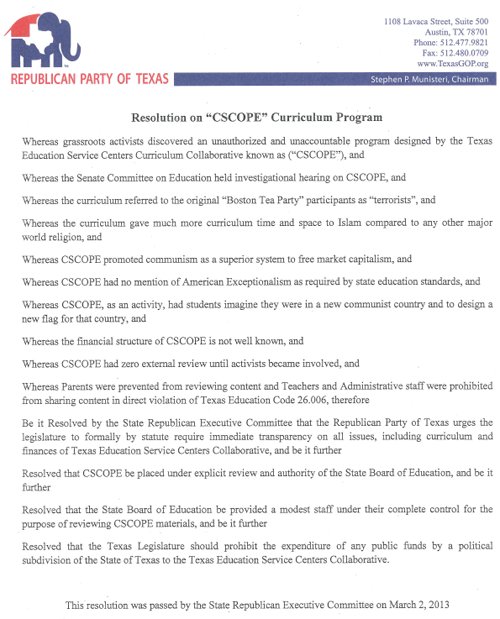 If you have not heard, a rogue group hidden within one-and-then-more regional service centers (RSC) of the Texas Education Agency (TEA) called CSCOPE (no particular acronym meaning, except that software possibly started from a progressive leaning company with similar initials). It has been hidden from public view due in part to some questionable 501c3 filings that seem to have only one purpose—to keep their operations as secretive as possible. When activists discovered this, CSCOPE has been trying to cover its tracks, but of course that’s really not possible in today’s world. Truth has a way of coming out eventually, especially when dedicated activists are involved. To help encourage the Texas legislature to do something about it, the State Republican Executive Committee (SREC) unanimously passed a strong resolution this past Saturday (Texas Independence Day!) to immediately start formal oversight and perhaps shutting it down entirely by cutting off funding. (Yes, it was being run with taxpayer money through a tangled web that has still not been revealed entirely.) Representative Steve Toth (R-The Woodlands) has filed HB-760 to do many of the items in the Resolution. (Other “authors” since filing now include Reps. Debbie Riddle, Dwayne Bohac, Linda Harper-Brown, and Lois Kolkhorst, and many additional “co-authors”.) We encourage you to read the entire Resolution from the SREC below. The Republican Party continues to show that it clearly has better ideas than Democrats. 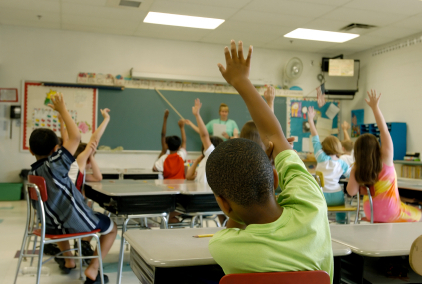 Republicans work hard for solid education for your children—we do not just blindly support union wishes like the Democrats. The Republican Party values are better for your family.